Edamame is the name given to immature light green soybeans. They are fast cooking, nutritious and versatile, noted food columnist "The New York Times" Mark Bittman. Edamame is available fresh or frozen, either peeled or still in the pod. Toko Hayati Fresh & Frozen Seafood Sell Frozen Edamame Beans. Storing one or two frozen edamame bags in the freezer allows you to prepare snacks, purees or dips from cooked beans in minutes. You can also add edamame to salads, stir fries or soup. Edamame is boiled most often, even though you will retain more vitamin C and B than nuts if you steam it to reduce contact with water. If you like, you can steam frozen edamame in a microwave. While some commercial brands are sold in microwave bags, you can also put edamame in a glass bowl with a little water. Cover the bowl with plastic wrap and microwave to high until soft. Microwave times can vary depending on your microwave wattage. 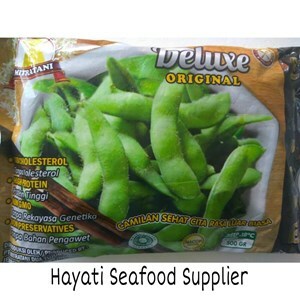 Frozen Edamame is easy to find, one of them is Toko Hayati Fresh & Frozen Seafood. Sell frozen Edamame nuts, so healthy and versatile. Edamame works well in every dish where you usually use peanuts or peas.